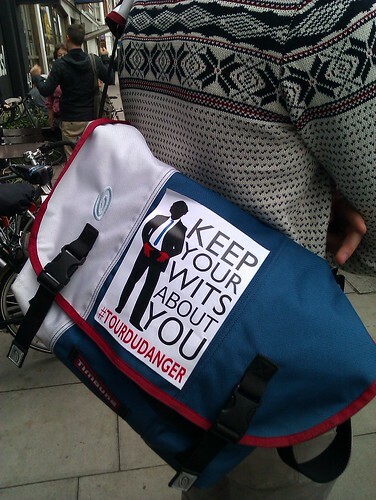 Locus Sigilli: "Tour du Danger"
For a city as big as London it is hard to stay slow, relaxed and bike-friendly. Activists praise very well organised facilities of Amsterdam and Copenhagen, but it's usually omitted that the population of those two cities combined makes only 15% of the number of Londoners. So yes, maybe you couldn't expect that much in the given circumstances. Those who think otherwise still were witnessing that it was getting a bit better every single year. The death toll for cyclists has been continually decreasing: 21 lethal accidents in 2005, 19 in 2006, 15 in 2007 and 2008, then 13 in 2009, then only 10 in 2010. 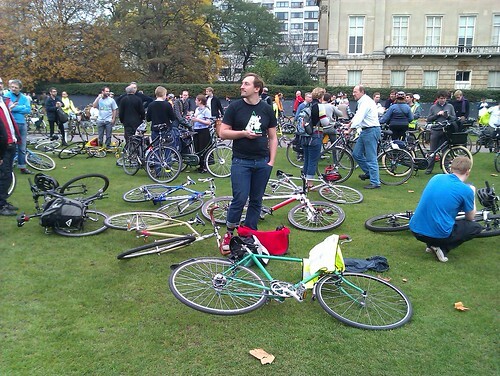 One too many, but the tendency was optimistic, especially considering that every year more and more people were getting involved as cycling gained its former popularity back. As a mayor of London, Boris Johnson started with very inspiring pledges. 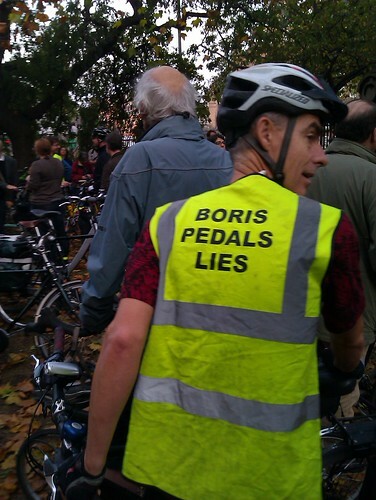 Commuting by bike himself, he established the bike hire scheme (hence the unofficial but widely used name, BorisBikes), backed campaigns encouraging people to get on two wheels and introduced dedicated bike lanes, so called "cycle superhighways". Maybe it wasn't that bad after all. It's only November now, it's not snowing or even raining much, and yet there are already 15 cyclists killed on the streets by motorised vehicles - a regrettable record! Tensions were also risen by the contradictory TfL decisions over the redesign of several key junctions and "road bottlenecks", Blackfriars bridge to name. More of that, the city authorities (and "the cycling enthusiast" mayor himself) kept saying "No" to any suggestions, simply declining the existence of the problem. In last three weeks, two people got killed on the same junction, and even more, on the very much celebrated "cycle superhighway", which suddenly turned out to be nothing more than a stripe of blue paint offering false feeling of protection. In brief, that's how a humble flashride planned by two bloggers became an enormous "Tour du Danger". 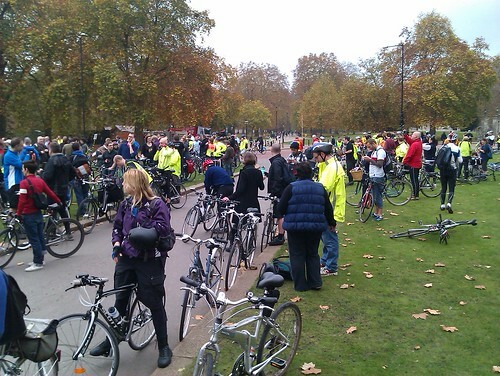 Today hundreds of cyclists rode through 10 of the most dangerous junctions in Central London and around in attempt to raise attention. If you managed to forget about the reasons of the event, it was pleasant and smooth. It was different from the SkyRide experience as this time I was the one being marshalled having enough time to ring the bell and raise hand to greet cheering bystanders. Many thanks to today's marshals blocking the roads for us and enduring the yelling motorists' aggression (poor lads, today they reached their undoubtedly urgent Saturday destinations 5 or even 10 minutes later). Be careful on left turns - it's surprising but most accidents happen on left turns rather than on more complex right ones requiring your to negotiate through lanes. If you're turning together with a large vehicle as a bus or a lorry, it can get too close to pavement with its long body, hitting you eventually. And if you're not taking a turn moving forward through a junction, it's even more dangerous as you need to make absolutely sure nobody is going to take that turn from the lane right to you. Hence always try to stay behind (not even in front of, when possible, for it wasn't enough for some victims) the larger vehicles when passing junctions. Ladies, take extra care - most of the victims are females, e.g. 10 out of 13 in 2009. I don't know why, but it is a very disturbing fact considering that there are not so many women cycling at all. So if you're a woman, please think what in your road behaviour could you improve. If you're male, however, it's worth thinking as well. 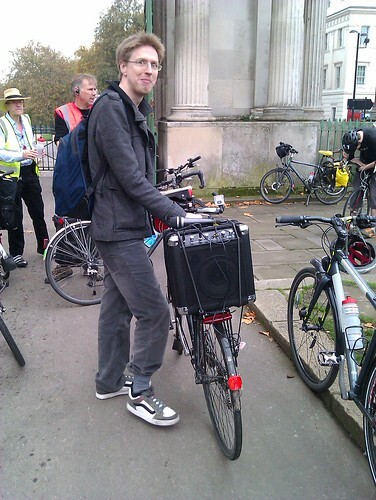 Consider wearing a helmet - I can understand "Dutch-style" activists who are against wearing lycra and helmets as it turns casual cycling into something you need to be prepared for with a special set of clothes, shoes and stuff, making actually taking a bus a lesser hassle. As to me, lycra is too much indeed, and certainly helmet won't help you if you get run over. Still, if you're just knocked off your bike, it might help you get away with that. Incidents like that also happen. And fasten your chinstrap - many people have them dangling way below their chins rendering their helmets almost useless. Another thing to remember is that we're having troubles also because of more people cycling, more than ever in last years. I can see that even with my short experience of living in London, there are more and more people on the roads. So don't be afraid and join us. It's fun. P.S. I was recording the route, see it here. It's not very accurate near the Hyde park - my phone lost the signal there for some reason, so it just shows a straight way through Green park - but apart from that it's fine. Update: You can see me twice (blue helmet, black beard) in BBC report starting from 31s and 59s. Update: More decent and numerous photos from another participant (found myself there as well). Update: Report from one of organisers with more links to media coverage.